Antibodies against one strain increase risk of infection with another. 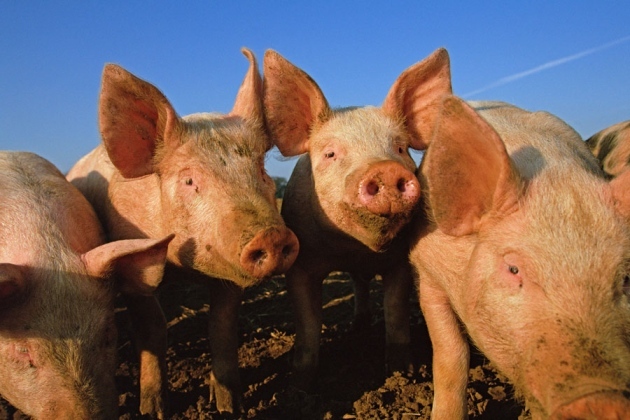 Pigs vaccinated against H1N2 influenza were more vulnerable to the rarer H1N1 strain. Preventing seasonal sniffles may be more complicated than researchers suspected. A vaccine that protects piglets from one common influenza virus also makes them more vulnerable to a rarer flu strain, researchers report today in Science Translational Medicine1. The team gave piglets a vaccine against H1N2 influenza. The animals responded by making antibodies that blocked that virus — but aided infection with the swine flu H1N1, which caused a pandemic among humans in 2009. In the study, H1N1 infected more cells and caused more severe pneumonia in vaccinated piglets than unvaccinated ones. The root of the different immune responses lies with the mushroom-shaped haemagglutinin protein found on the outside of influenza-virus particles, which helps them to attach onto cells in the airways. The protein occurs in all types of flu, but the make-up of its cap and stem vary between strains. In the study, a vaccine for H1N2 spurred pigs to produce antibodies that bound the cap and the stem of that virus’s haemagglutinin. But some of those antibodies also targeted the stem of H1N1’s haemagglutinin protein, helping that virus fuse to cell membranes. That made H1N1 more efficient at infecting pigs and causing disease. The finding may give some vaccine developers pause. Much of the work to develop a universal flu vaccine has targeted the stems of haemagglutinin proteins, because they are relatively consistent across many types of influenza viruses. Gary Nabel, a flu-vaccine researcher and chief scientific officer at the biotechnology firm Sanofi in Cambridge, Massachusetts, agrees. “It raises a warning flag, but at the same time it provides a tool to manage that risk,” he says of the new study’s results and methods. Still, researchers have not yet tested whether human influenza vaccines can produce the same effect. And differences between pigs and humans make it difficult to interpret how relevant the findings are to the development of human vaccines, says Sarah Gilbert, a vaccine researcher at the University of Oxford, UK.